Summer fun heats up as we head into mid-August. Performances and exhibits expressed through all the arts, nature adventures and presentations on just about everything under the sun make for diverting days and lively nights As we wind up the Week Ahead, get ready for three of the most anticipated events of the summer season. Illumination Night on Wednesday, August 16 and the opening day of the annual Agricultural Fair the following day on Thursday, August 17, do in fact fall within the coming week but we’ll be anticipating the excitement of the upcoming Oak Bluffs Fireworks on Friday, August 18th too. So hang on to your hats, the Week Ahead is about to plunge into the deep end of summer’s pool of good times for all. This Community Dance Festival’s shows are free, open to the public and appropriate for all ages. Audiences may come and go as they please. August is peach season, so mark your calendar for The First Congregational Church of West Tisbury’s Seventh Annual Peach Festival. Just because it’s always fun to learn something new – bring an item of clothing or other article made of natural fiber (like cotton, wool, linen, or silk) to dip in our indigo vat. Summer Soiree and Auction celebrates 36 years of making a difference in our community. An elegant summer evening (rain or shine) at Farm Neck Golf Club with dinner. This summer, the MV Concert Series continues with comedy featuring The Capitol Steps! 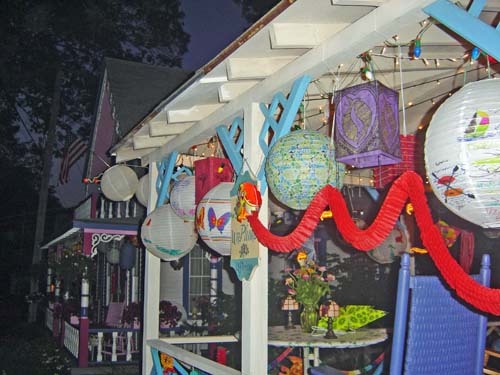 With Illumination Night just a day away, kids are invited to come paint a paper lantern. Register and purchase your lantern in advance at the office. Celebrate Illumination Night by painting your very own lantern. Two sessions: one at 10 am, and one at 11 am. As is often the case in work rooted in diverse and often ancient cultures, the traditions and innovations within artistic practices come see this reflected in dance.